This 1938 Stewart-Warner table top set has been completely restored inside and out. The inlay veneers really make this set stand out. They have been professionally refinished with period toning lacquers and are in really beautiful condition with no cracking or splitting. Much like Emerson had the Ingraham Cabinet Company, Stewart-Warner had its own cabinet company, Craft-Built, and the original Craft-Built tag is still on the full wooden back. Four original wooden knobs for on/off, tuning, band and tone. It is an AM/SW set, and the AM reception is good, while SW reception can be enhanced with a longer antenna wire. The brass escutcheon has been polished back to its original shine, with a new clear perfect dial cover and grille cloth. 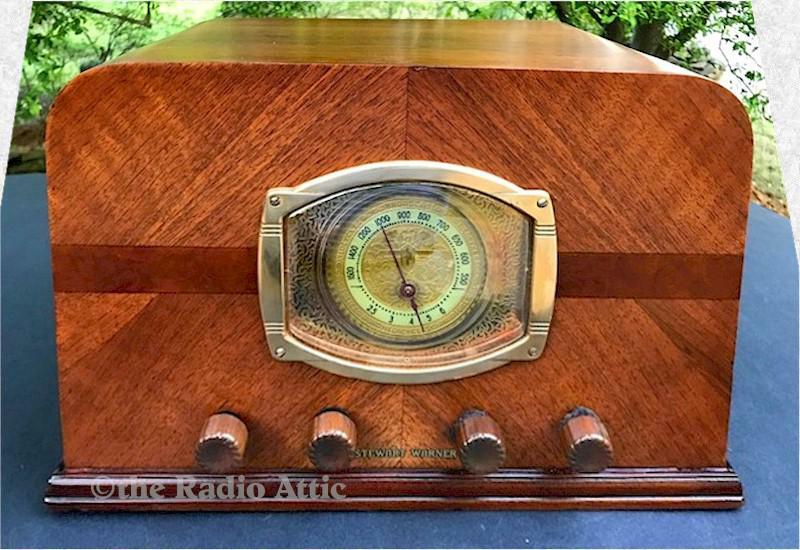 This radio really has a striking detailed lighted gold dial with clock dial pointer. The chassis has five tubes and a power transformer, and it has been gone over completely by a professional, and everything that needed changing was done. About 13"W x 9"H x 8"D.
You are visitor number 1,079 to this page.